I first got into Basara by Yumi Tamura years ago. I bought the first volume and then didn’t buy the second volume until a number of years afterward. I couldn’t tell you why I stopped reading Basara for so long, but I do know that when I picked it up again I re-read the first volume and finally fell in love. Unfortunately for me, Basara had been completed and many volumes had already begun to go out of print. I managed to find 26 volumes of Basara at or below MSRP. My favorite comic book shop carried many of the in between volumes and I managed to snag most of the rest for cheap at conventions and swap meets. Only volume 19 eluded me. Then a friend tipped me off to the fact that Lulu.com had it for sale for around $7. I ordered it, but it was not meant to be and Lulu cancelled the order weeks later. I finally just caved and bought a used library copy for about $40. I really just wanted to finish reading Basara! I had all the other volumes lined up, ready and waiting to be read! So I got that copy of vol. 19, which only had some cover damage, and gleefully finished this classic epic tale. If you haven’t heard much about Basara before, the story covers the struggle of Sasara, who witnesses the massacre of her village. Her entire family is killed, including her brother Tatara, who was considered to be “the boy of destiny.” Sarasa cuts her hair and poses as Tatara to fool the attackers, the Red King and his army. This sparks a wild goose chase for Tatara as Sarasa and the few remaining survivors from her village attempt to avenge their loved ones. In the process, Tatara/Sasara’s quest for vengeance turns into a full-blown revolution attempting to overthrow the monarchy in a post-apocalyptic Japan. (To clarify, the Red King is the son of King Ukon, who rules over all of Japan. Prefectures are controlled by other members of the royal family.) As her goals shift towards freeing the Japanese people from oppression, Sasara gains a very colorful cast of allies who all swear their undying loyalty to her. It’s all very shounen manga-esque, despite the fact that Basara is a shoujo manga. And that’s the one thing I really love about Basara: it’s the kind of manga I *wish* Naruto, Bleach and all those other long-running, filler-prone shounen epics were like. There is action, adventure, political drama, romance, intense camaraderie and yet Yumi Tamura allows Sarasa to be a girl as well as a hero, without ever losing relevance to the main plot. Man, I would buy so much more shounen manga if it read like Basara. Tamura first does this by allowing Sarasa to fall in love with a mysterious fellow she meets at a hot spring. As she becomes more and more interested in this man, Sarasa must still return to fight as Tatara and become a man again. It comes to the point where Tatara and Sarasa conflict and Sarasa is forced to choose one in order to keep the revolution going. Instead, Sarasa learns to sideline her personal feelings in order to protect the lives of her comrades and attempt to achieve the greater good. Going a step further, Sarasa doesn’t totally put away her womanhood, but allows it come out when she gets the chance to let her hair down. Just the fact that Tamura explores Tatara/Sarasa’s deep personal conflicts about the rebellion she’s leading and allows her to cry about it with no shame or stigma is refreshing. The second example is when Tatara/Sarasa must reveal to her growing band of followers that she is female and not actually the original boy of destiny. Because of the elaborate ruse Sarasa had to commit to fool the Red King and his army after her brother was first killed, only Tatara’s inner-most circle knows that Tatara is really female. Because of Tatara’s increased notoriety and attempts to squash her, even many of Sarasa’s fellow villagers are not filled in on the truth. At first it feels like Tamura is using this caveat as a perceived weakness, something that could surely bring about Tatara/Sarasa’s downfall. But while Tamura seems to play that card, she turns that perception around when Sarasa finally reveals her gender to her followers and they accept her anyway out of fierce loyalty to the leader who has proven herself over and over again while holding their lives and their skills in high regard. To them, it doesn’t matter whether Tatara is male or female, just that Tatara is a capable, caring leader who attracts her followers with infectious warmth and determination. Because of this Tatara/Sarasa learns to trust her followers more and really begins to transform from a figurehead to a leader that is truly amongst the people. Of course, this isn’t to say she isn’t an integral part of her own rebellion, just that she is only one part of a larger operation. Without Tatara the revolution would not be successful, but without Tatara’s followers, things wouldn’t work out either. There are, of course, many twists and turns to Basara that feel like they take the reader away from what’s important. Especially in the middle volumes, Tatara seems to be doing a lot of pointless little side missions and then she runs off with her mysterious man, Shuri, for awhile after becoming exhausted by fighting. But each encounter Tatara/Sarasa has, she learns something and/or gains important allies that return to fight with her as Tatara’s rebellion really begins to gain traction. Sometimes Tamura goes into the stories of the many characters (no, seriously, there is a huuuuuuuge cast of characters), but again many of these side stories wind up becoming relevant to the main story or are somehow deeply connected to the main story. But this isn’t a happy-go-lucky shoujo manga, so a lot of these stories are dark and unhappy, perhaps to portray just how bad life is for everyone in this post-apocalyptic nation. Even the ending of Basara is bittersweet. While Tatara reaches her goal (as if you had any doubt that she would), many people’s lives are lost even as Tatara works hard to prevent needless death. Sarasa and Shuri get to be together, but there are still many obstacles that stand in their way. Tamura only begins to show the happy ending everyone has been striving for as she completes Basara with two volumes of short stories. And even those are still rife with pain and suffering before anything positive begins to happen! It’s kind of odd for a manga centered around a revolution that’s supposed to be about cherishing people’s lives. Basara never really caught on with readers, probably because of Tamura’s art style, which is sketchy and complicated. For whatever reason, Tamura’s lines sometimes becomes so uneven that you wonder if that’s her style or if she was too exhausted to draw properly. It looks dated in comparison to most of the shoujo that came out in 2003 and is more reminiscent of Moto Hagio’s style than Arina Tanemura’s. The manga is also visually busy, which unfortunately seems to turn off most readers. I hear a lot of complaints from readers that manga like Basara (in visual density) are too confusing to continue reading. I cannot help but wonder if this was part of the reason Basara and Tamura’s other manga published in English, Chicago and Wild Com, didn’t do well. Either way, we’ll probably never see more Yumi Tamura manga in English. I’m really glad I got to read Basara all the way through. It was definitely worth the wait and the cost of that one last volume. Check it out if you can find the volumes in stores or at a library. This entry was posted in manga, opinion, reviews and tagged Basara, Chicago, manga, shoujo, shounen, Viz, Wild Com, Yumi Tamura. Bookmark the permalink. I’m very happy that I stuck with Basara. After reading some positive reviews, I tried out the first few volumes and found the art uneven and the plot overly-complicated. I dropped it for a while and then went back, determined to finish a shojo classic of epic scope that I could actually find at the library (I read Please Save My Earth for the same reason, and I loved it). The story started to kick into gear for me after I realized that most of the characters, including the “villains” were going to be presented in a three dimensional way, with back stories and character growth and imperfections. This is not a simplistic children’s fairy tale, and while it allows for one-note comic relief characters and bad guys, most of the characters have much deeper roots and motivations. I fell in love with the series, and now I’m wondering what else is out there–Where are the shojo action fantasy/sci fi manga, and why doesn’t anyone publish them here anymore? Basara, Please Save My Earth, Fushigi Yugi (and it’s incredible but as-yet-unfinished prequel, Fushigi Yugi: Genbu Kaiden), almost everything else by Yuu Watase: I know that they came out in Japan, and I know that they were popular enough to span dozens of volumes worthy of their epic lengths. But many of those titles are out-of-print, and romcom seems to be the main type of shojo brought over to the States, while epic shonen adventures are a dime a dozen (or 2-3 dozen for things originally published in Jump, like One Piece and Naruto). I won’t spend too much time wondering; they probably didn’t sell well enough as they were coming out to justify licensing new ones right now (I’d argue that the manga readership has skewed a bit older in the past few years and that authors like Tamura and Hiwatari are worth another try, but the only publisher I have to argue with is Viz, so what’s the point?) Instead, I just took out a bunch of “Red River” volumes from a library. Haven’t started reading them yet, but as they were advertised in the end pages of Basara, I’m hoping they’ll be up to par. Weird, wordpress flagged your article as spam. Despite the many times you comment here… Oh well, caught and fixed! Yeah, I imagine my feelings were the same when I first read Basara vol. 1, but I’m glad I rediscovered it! It’s really refreshing to see such intricate writing in shoujo, especially when so many shoujo manga published in the U.S. these days are formulaic romcoms. But then again, I imagine that there will always be tons of formulaic romcoms at any time and just a few manga that really break that mold. From Far Away was also heavily advertised in the end pages of Basara…you know, I’m starting to think that the problem was that Viz released all these epic shojo titles around the same time and they just didn’t take. 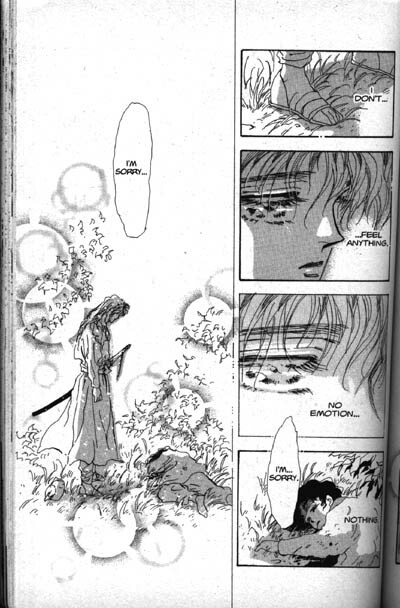 Fushigi Yugi was a hit, but readers may have been confused by all the similar shojo released in its wake. I loved how politically astute Basara is. Tamura makes note of all the problems that can come up while rebuilding a nation, from the economic fallout, to the feelings of the people, to international relations. I also enjoyed her exploration of the press/media and its effect on revolutions. Her post apoplectic Japan did not have the internet, but she crafted a Benjamin Franklin-esque hero in Taro and showed the bravery of journalists who fight against oppressive regimes, a message that is so timely right now! As a news/journalism junky I really appreciated Taro’s role in the revolution! Perhaps that is it, but Fushigi Yugi was certainly published well before Red River, Basara or From Far Away came out in English. (I know this because the first printings of FY are in Viz’ old trim size.) Fushigi Yugi probably picked up the initial fans that Red River, Basara and From Far Away were meant to follow up on. The problem with this is that Fushigi Yugi was done in a more modern style than the others. Despite the fact that they all ran around the same time, Yumi Tamura, Kyoko Hikawa and Chie Shinohara are all kind of 80’s-style mangaka. Yuu Watase was more of a 90’s-style mangaka and you know what they say about older manga not being popular… It sort of pertains to work done by mangaka who hit the peaks of their popularity in previous decades too. Sarasa does get a little annoying, but I’m sort of glad that Tamura allowed her to be that way and then grow out of it naturally. I often wonder how world leaders, celebrities and other public figures do their jobs without breaking down, so it was refreshing to see Sarasa be so flawed and to work through it. If she had more of a stiff upper lip, I think I would have pegged her as a boy in girl’s clothing, you know? I’m a little sick of that archetype and some girls totally get all conflicted and sobby like that (I’m one of those girls), so I was glad Sarasa was allowed to just be a stereotypical girl. Going into battle, on dangerous missions, risking peoples’ lives, etc. seems pretty stressful to me, so I was able to forgive Sarasa for being a little whiny sometimes. Thanks for reminding people that an awesome shoujo series like Basara is out there (although getting much harder or costly to find). I was buying Basara as it was being released, and I loved the release rate of the volumes. So many series have their books come out quarterly or even less often, and they take forever to finish. IIRC, the early Basara books were getting an bimonthly release, and it allowed the story to keep its momentum. I loved Sarasa and Shuri, and so many others of the large cast, and I teared up when one or two of the characters died. I remember reading Chicago and Wild Com long ago (they were both in one or another of Viz’s anthologies, weren’t they?). I think that I own the graphic novel(s) for one of the two, but I don’t keep my manga in an easily accessible arrangement and I couldn’t tell at a glance (on some of my closet shelves, manga is three deep ^^; ). I bought and read Please Save My Earth and also From Far Away, but I never really felt like going back and rereading them, so I gave away those series to make room for other titles. PSME kept my interest all the way through, but I started losing interest in From Far Away as I worked my way through the second half. I don’t remember the character names! ;_; I didn’t care for the plotting and actions of the villains in FFA, and dealing with the internal issues (is that vague enough? ^_- ) of the leading man wasn’t compelling enough for me. I think that what I loved most about FFA was how the girl didn’t instantly know (or even rapidly learn) the language of the world that she ended up in, and watching her efforts over a few volumes to be able to communicate with something other than gestures. I really like her, but not so much most of the others. I still have my Red River books, and I reread them occasionally. It was a series that I mostly loved reading (some of the actions taken against Yuri started to get repetitive) alongside Basara, and I always looked forward to the next book, even when Viz started to drag out the release toward the end. The best parts of the story for me were when Yuri was leading the fight, rather than reacting to others. I was getting quite sick of Black Water (no, not the mercenaries) toward the end of the story. Well, I’m glad to hear that Basara’s place wasn’t too fast. Shoujo manga don’t often get speed ups like some of the shounen manga out there, so I thought perhaps it was too much for some. I never got the chance to buy Please Save My Earth, but I wish I had. It gets so much good praise from people. I’m really sorry to hear that From Far Away didn’t click with you. I thought that things started getting more interesting in the second half of the series, but perhaps that’s just me. I was definitely interested in the main villain as he had such a weird perspective of the world. The fact that he and the leading man were tormented by the same evil spirit made the difference in their characters much more compelling. I don’t think I’ve re-read Red River yet, just because most of it is at my mom’s currently. I really started getting bored with it after awhile too. Yuri is much more of a girly pushover towards the end. For some reason, she loses that ready-to-stand-up-and-fight edge that she initially had and that Sarasa/Tatara kept throughout all of Basara. For as much as I loved Fushigi Yuugi, I’ve never completed the manga or the anime. Mostly because I was just a kid when it was released and didn’t have the funds. Now, it’s simply unavailable. But I know a lot of people were really into it and it was pretty popular, which is why I suggested to Ahavah that perhaps they licensed all this other fantasy shoujo to entice readers to buy more of it.